The ineffectual, idea-free man, whom Apple unveiled on stage today. CUPERTINO, CA—At a highly anticipated press event at its Silicon Valley headquarters Tuesday afternoon, tech giant Apple officially unveiled to the public a panicked and completely idea-free man. The white, ultrathin man, who exhibited such features as artificial excitement, a fully quavering voice, and what appeared to be a near total lack of inspiration, was put on full display for thousands of shareholders, industry insiders, reporters, and fans today in what Apple hopes will be a game-changer for the multinational corporation. “Our customers expect the best products from Apple, and that is what we will continue to deliver,” continued the feckless man, offering a tedious, innovation-free display and a high rate of perspiration. 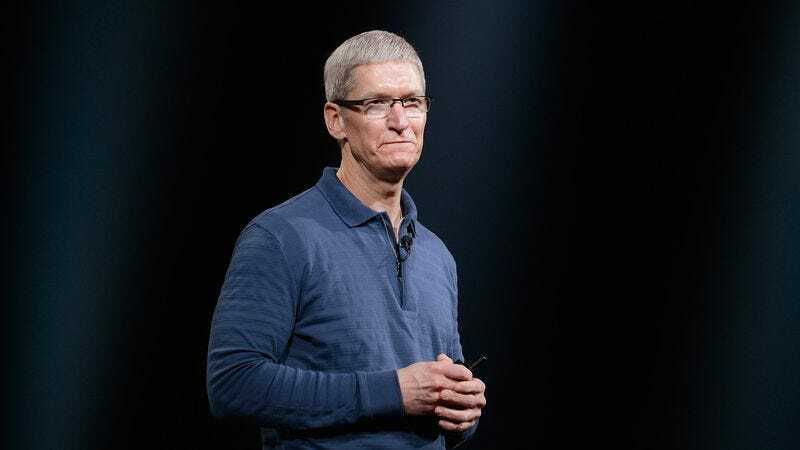 Experts told reporters the success or failure of the hapless, perplexed man will have an enormous impact on Apple’s profits and revenues for the foreseeable future. The completely ineffectual male human, reportedly priced at roughly $4.17 million per year, is also expected to both shape and inform all Apple products and their design for years to come. However, early reports suggest that a majority of the event’s attendees were unimpressed by the panicked man, with critics complaining that the creatively bankrupt individual is “largely useless” and a stark departure from the company’s visionary and industry-leading ethos. Industry sources reported that while many loyal Apple customers were largely unenthusiastic about the panicked man, they remained quite happy with the previous model, discontinued in 2011.